This halaan and tausi guisado recipe is actually sauteed clams with salted black beans. Sauteing or stir frying is a usual way of cooking with Chinese cuisine and not to mention, the salted black beans. Salted black beans has a distinct flavor compared to salted yellow beans although they might be similar, it will not taste as good as the black beans. Anyway you can experiment if your local grocery store or supermarket ran out of stock and your only choice is to get a substitute. 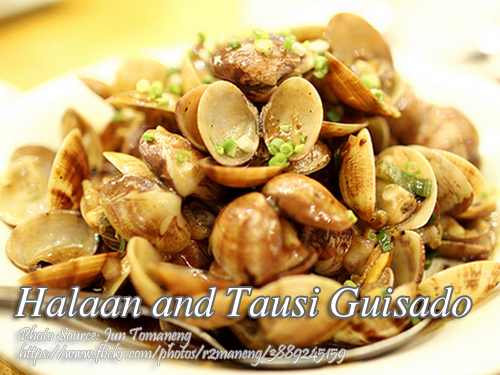 To cook halaan and tausi guisado; Soak the live clams in water for about 4 hours to spit the sand and other particles. Then wash thoroughly and set aside. Heat oil in a frying pan (or small carajay or wok) over medium heat. Add in garlic, ginger and chili. Saute for 1 minute or until fragrant. Pour in the cornstarch and water mixture and let it boil. Add the clams and simmer until the shells are opened. Add sugar and tausi. Add in leeks and stir cook lightly until done. Soak the live clams in water for about 4 hours to spit the sand and other particles. Then wash thoroughly and set aside. Heat oil in a frying pan (or small carajay or wok) over medium heat. Add in garlic, ginger and chili. Saute for 1 minute or until fragrant. Pour in the cornstarch and water mixture and let it boil. Add the clams and simmer until the shells are opened. Add sugar and tausi. Add in leeks and stir cook lightly until done. Serve hot.